When we think about “celebration” whether it is birthday parties, sports, or wedding parties Champagne comes in top of our mind. This sizzling spirit let everyone get spoiled into the party mood. Yes, this wine opened up millions of parties around the World and leading its own place. All of us tasted this sparkling wine at least once in any of our family or office parties and get into the world of joy. The celebration with Champagne is the sign of victory. Lets take some time to know more about this thunder wine, the bubble beauty. Champagne comes in different size of bottles starting from 1.5 litres to 18 litres, though 1.5 litres is considered as the best one for its matured quality. It consists around 12% of alcohol and its style depends on the amount of sugar added during the second fermentation. It comes in various ranges from very dry, dry, medium sweet and extremely sweet. Champagne is actually a form of wine, however, all sparkling wines are not Champagne. Only those which are made in the Champagne region in the northeast of France are called Champagne. We have seen that intentional spraying of Champagne as part of some sports trophy presentations and parties. However, this opening will waste much of the champagne. 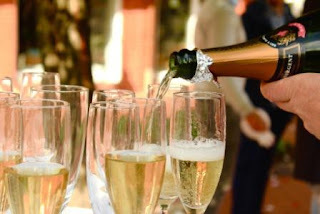 To reduce the risk of spilling Champagne and/or turning the cork into a dangerous projectile which leads to wounding, the best way to open a Champagne bottle is by holding the cork and rotating the bottle rather than the other way. By holding the bottle in 45 degree angle, you can minimize the excessive bubbling and wastage. A sabre can be used to open a Champagne bottle with great ceremony. This technique is called sabrage (the term is also used for simply breaking the head of the bottle). To say about the healthy side, the moderate consumption of Champagne may help the brain cope with the trauma of stroke and Alzheimer's. Research shows that the high amount of the antioxidant polyphenols in sparkling wine can help prevent deterioration of brain cells due to oxidation stress. Fine, which one is the best champagne to toast with? Try the below, the prices of the below list may not be good for the weak-heart, but its all worth for the price. Most wine experts recommend Blanc de Blanc for light foods and Blanc Noir if you are looking for heavier meals. Now, what to eat while you enjoying Champagne? The choice of Goose or duck liver goes well with Champagnes. Cheese is the best one for all the time. Oysters make you feel your drinks. Mushrooms come in the next place for the best fit. Let's start celebrating parties with Champagnes! Would love to have some. Following back! Very informative post. Thank you for the visit. Champagne is a high class drink here. I am having a glass right now!! Nice article for champagne and liquors. With pairing of foods. Champagne is for a classy kind of celebration - we used to have it all the time before. Yummy. It's nice to have champagne every now and then to celebrate with family and friends. Let's cheers to that. I rarely drink champagne though.